At the start of the year I wrote lots and lots and lots and lots about a range of behaviours connected to information seeking and navigation. The stories and sets of behaviours I described have been useful for teams thinking about the different modes and behaviours that users might flow through and between as they complete tasks and use our services at the BBC. But I’m not sure the model I proposed is as useful as I’d hoped for the service-design based toolset I began describing here. So, I’ve done some more thinking and have another way of describing information related behaviours as we move towards creating a shareable vocabulary to describe the behaviours, interface and functionality to support navigation. 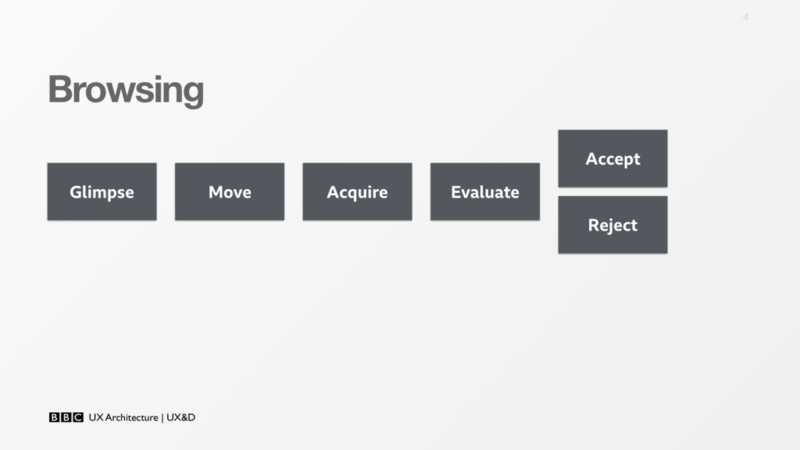 Interactions are often prescriptive paths that we define for a user that involves movement through a product. These might include a checkout process or uploading workflow. But it could also be a ‘search tool’ that sees a repeatable linear process followed. 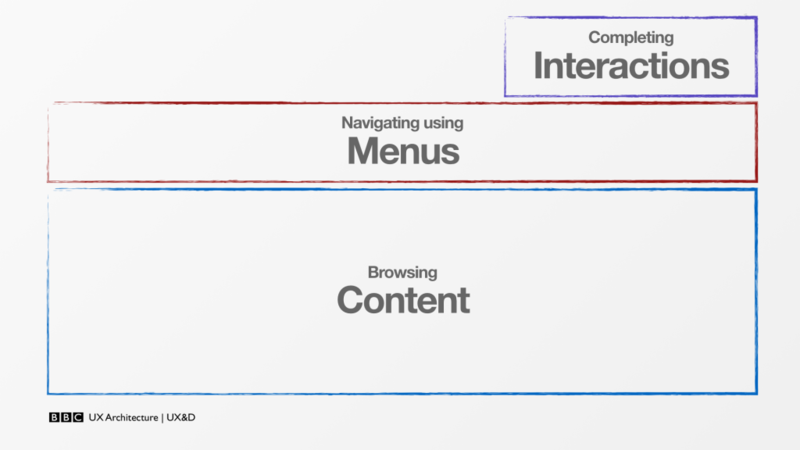 Menus enable the user to navigate. They use the menu to transport themselves across and within (and sometimes between) digital places. Along with these three types of furniture and behaviour I’ve started to think about levels of intent and familiarity with the information space. Interactions tend to be highly motivated, but the user might have varying levels of knowledge and confidence with what is being asked of them. 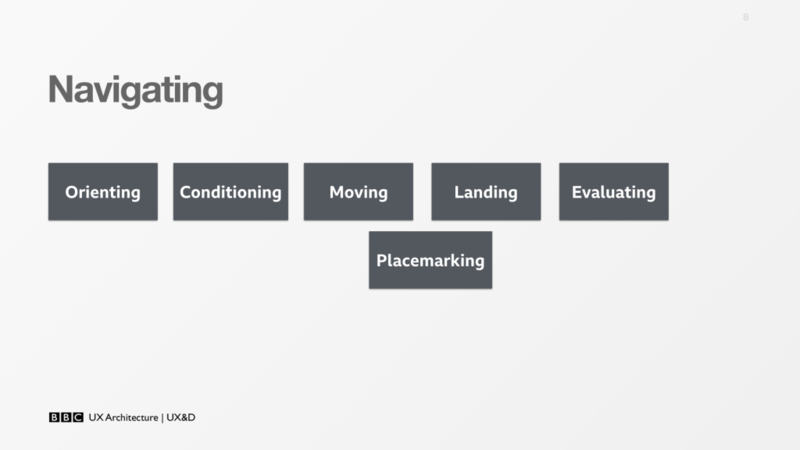 Navigating is usually intentional – but I think it can vary in whether the goal is focused on something specific or whether you’re navigating for the sake of exploring and developing your mental model of the space. 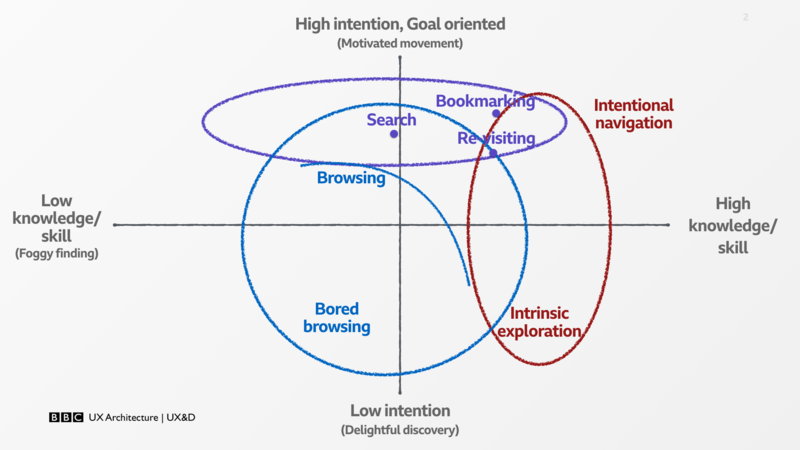 I think content-based navigation can vary in levels of intention and knowledge. Considering these two axes help me to identify and think about specific types of navigating and how we might better-support those specific behaviours. 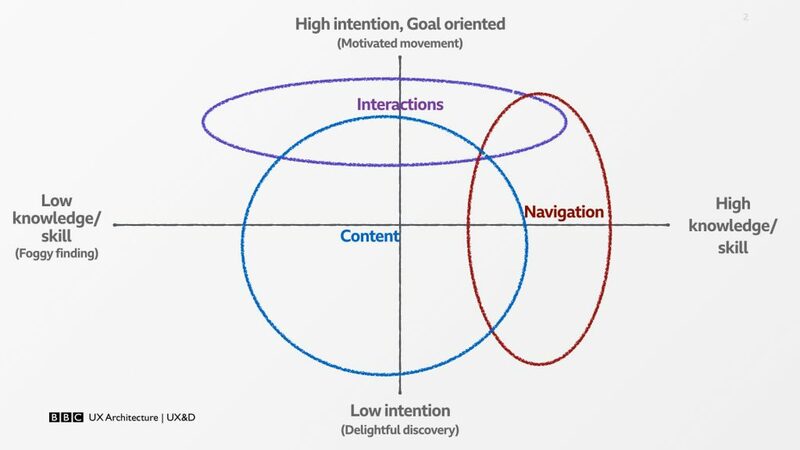 I think there’s value in then breaking down these ‘navigation journeys’ into tiny, granular moments, so that we can test and optimise the moments where we might fail, make things easier or intervene and re-route a user. So I’ve started to think about specific types of navigation behaviour. The next stage for our ‘Navigation masterplan’ is to develop our vocabulary to describe these micro-moments. We can then relate them to specific features or elements of interface and begin to standardise and experiment in how we meet these needs and support these behaviours. if you’re interested in navigation and what we do next to develop our vocabulary, feel free to get in touch.